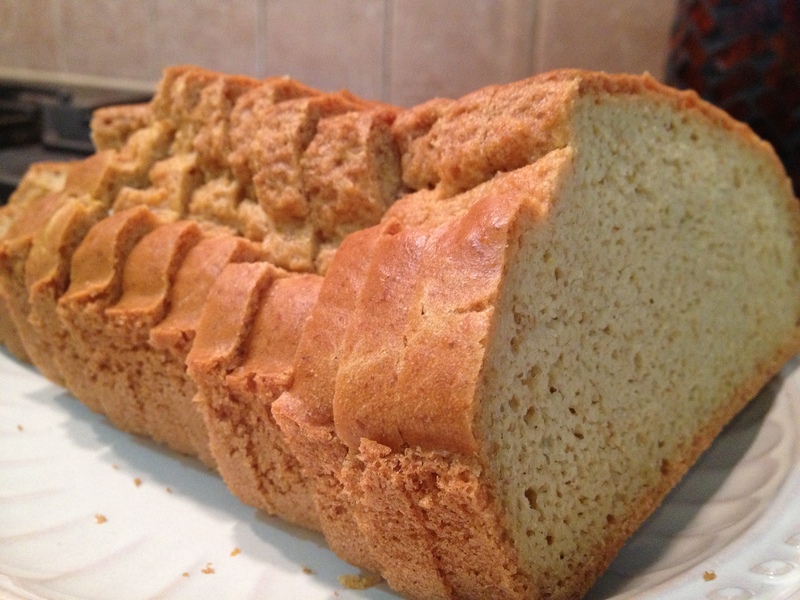 This is an extremely easy gluten free, grain free, sugar free bread recipe. It is a great substitution for traditional bread and can be used for sandwiches, to make french toast, to soak up soups/stews, or to toast with butter or almond butter. This recipe is very tasty and looks beautiful too! The bread is very sturdy and holds up well. It is also very moist so will not crisp as much as ‘regular’ bread when toasted. Combine the almond flour, garbanzo bean flour, flax meal, baking soda, and salt and pulse until blended. Add the egg yolks, butter, amasai or yogurt, stevia, if using, and pulse until blended. Spread into the greased pan. Bake for 40 minutes or until a toothpick comes out clean. Use a sharp bread knife to slice to desired thickness. Great bread!! Do you have the nutritional facts for it anywhere? Unfortunately I don’t. That will be the next step in my recipe posting journey. Although, I do have to say that part of the beauty of the Maximized Living Nutrition Plans require no counting calories and don’t have a big focus on the grams of this or that. The focus is on the quality of the nutrients. Can you use extra almond flour in place of the bean flour? I don’t have any bean flour available locally. I have not tried almond flour only. It may not turn out with the same consistency because almond flour is much more moist than the bean flour. Coconut flour may be a workable option though. You can try going to your local grocery store and ask them to special order some garbanzo bean flour for you. I have seen it at most “regular” grocery stores. You can also order it online 🙂 The next time I make a batch, I’ll try almond flour only. Is it suppose to have baking powder instead of baking soda? I made a loaf and it was nothing like the picture. It was flat, but tasted alright. I always use baking soda but you could try with baking powder to see if you get a different result. Give the grainless rolls a try also. They are super easy.